As a team we had many strengths but we also found some weaknesses looking back at the film. A good point would be that we all worked well as a team and allowed us to capture the shots quickly and of good quality. We assigned different jobs to each other so we knew what we had to do. For example I was in charge of filming, Ed was the accused and Lewis was the accuser which meant that things were organised effectively. The videos we took linked well together and the finishing product was professional. A weakness in the performance would be that the continuity between the shots in 2 of the scenes were different. 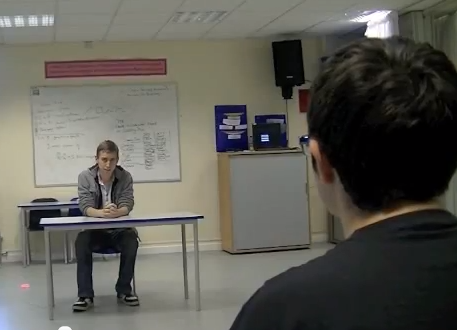 For example we had our teacher in one shot and when we moved the camera angle he ha gone. 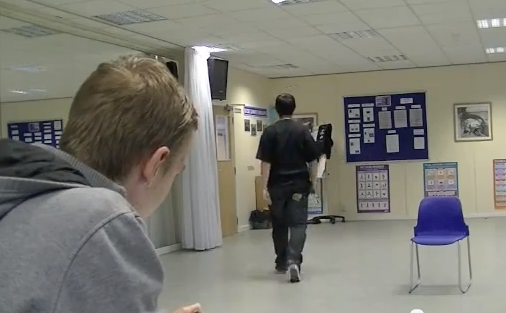 Also when we filmed the panning of the room you could see nobody in the chair reflected in the mirror but when Ed starts walking over Lewis is sitting down. To improve we could make sure all the videos link together seamlessly and that the continuity is better but overall we all worked well together and created a good first preliminary task. 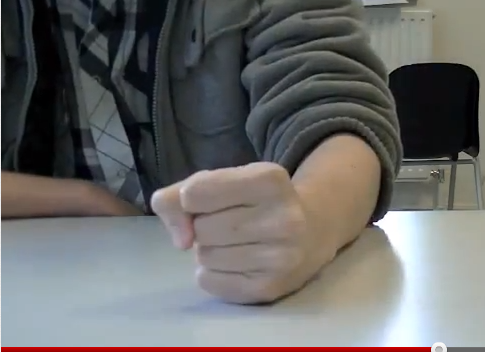 In the clip we use an extreme close up of Lewis’ fist to emphasise how mad he was about the conversation. By using the close up it shows a high hierarchy of status as he is in the foreground and classed as more important. The 180 degree rule is when you imagine a line going through each character in the conversation and only film from one side. This keeps the continuity as if we changed angles and sides with the camera then the audience may be confused. When filming we stayed on one side of the characters and this allowed us to keep the continuity running through the film. As you can see by this image we only filmed on the right hand side of the chair. We get the view of the door and both characters in the scene. 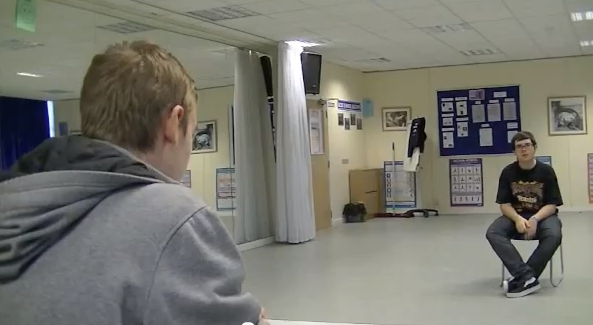 In the preliminary task we used shot reaction/reverse in the conversation between Ed and Lewis. This is when you shoot back and forth between two characters so that when they speak the audience will see who is speaking. We tried to keep the continuity by keeping the other character in the view in every shot so that you could see the conversation is still going on between the two. Also we used the rule of thirds to separate the characters and be more appealing to the viewer’s eye. In the first image we see Lewis’ face and the back of Ed’s head. This shows that Lewis is the one talking and the audience can see what he has to say and the expression on his face. The second image shows Ed’s face and the back of Lewis’ head so the camera angle changes depending on who is talking. The camera flicks back and forth between them. We used a match on action shot when Ed walked through the door. A match on action shot is when you cut just after an action has started, change the angle of the camera and then cut just as the action is finishing. 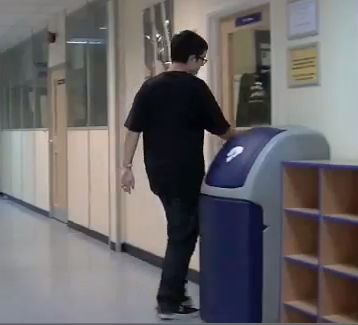 In this example we have Ed opening the door, we cut the camera and start filming the other side of the door whilst we film him come through. As you can see from the two shots on the first image you see that we cut after the first action where Ed opens the door and move the camera. Then we see on the second image that when he is finishing the action of coming through the door we cut again. In the preliminary task my group and I made use of a variety of different techniques of continuity throughout the film. 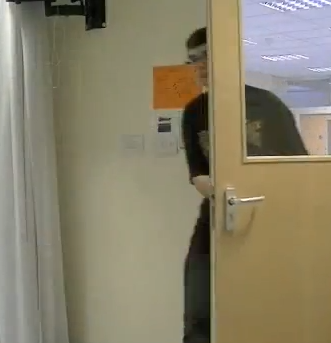 We started off with a panning shot of Ed walking towards a door. The action mirrored his movement and allowed a smooth seamless transition to the next scene. When he gets to the door a match on action shot is used. We chose this shot to show Ed walking through the door but by cutting out the middle section and moving the camera to another point where we can see him travelling through. We have cut from just after the action has started, in this example Ed opening the door. We finish with the action of just coming through the door. Once he has entered the room another panning shot is used to show what Ed can see in the room. This shows the audience what he can see and allows them to see a point of view shot of the room. Ed then walks over to the chair and a shot reverse\reaction shot is used to capture the conversation between him and Lewis. The shot cuts between the two characters and allows the audience to see the face of the person who is talking. Once the conversation is over an extreme close up shot is used to show Lewis hitting his fist on the table. This shows a high hierarchy of status as he is in the foreground and close up to the screen which means he is of higher importance than Eds character. We then use another match on action shot to show Ed walking back through the door, followed by a panning shot when he gets through the door. This is to show him walk away. Throughout the film a 180 degree rule was used. By doing this we only shot clips from one side of the characters and didn’t go past halfway other wise we would have lost continuity. We did this so the audience were not confused at which character was talking.